I feel like I haven't done any intricate nail art in a while so this was a refreshing change. 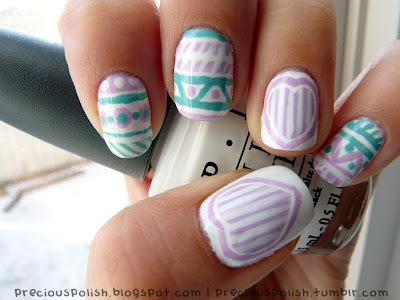 The colours remind me of Easter eggs and coincidentally, this manicure matches my new layout quite nicely. It's very spring-time appropriate which is ironic because the clouds finally decided to gift us a thick layer of snow today. Here's OPI Alpine Snow as a base on all nails with China Glaze Sweet Hook and China Glaze For Audrey for the details. Hi friends! Here's another 'sorry I've been away so long' post. I finish this semester in two weeks so once I get through this I'll hopefully be back on track. One of my New Year's resolutions was to work more on this blog so maybe I'll finally get on that. I started off with China Glaze Sweet Hook and sponged on Essie Van D'Go on the tips. I blended it all together with China Glaze Temptation Carnation and applied the gemstones on top. Started things off with Essie Sand Tropez followed by OPI San Tan-Tonio for the polka dots. The bow was done using Essie Nice Is Nice, all covered up with an Art Club purple glitter striping polish. Finally, here's something from the vault that I've been saving until now. It seems perfectly winter wonderland-appropriate now that the ground is blanketed with snow. I find that the iridescent pastel glitter is really pretty and delicate with this combo. I used a sponging technique for this glitter gradient. 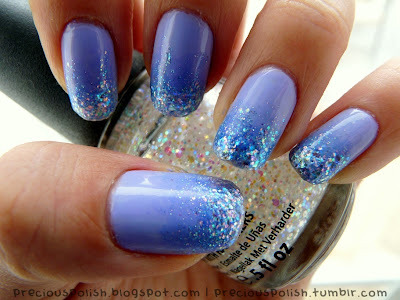 You can check out the video tutorial I did for it: "TUTORIAL: Glitter Gradient". I started off with Scandal Lavender Purple. Then I sponged on Sinful Colors Hottie and a bit of China Glaze Snow Globe on the tips.